Compared to the past 18 quarters, the Thai economy registers its greatest expansion with 4.3% growth rate in the third quarter of 2017, accelerating from 3.8% in the previous quarter. Overall, total GDP growth in the first three quarters of 2017 reaches 3.8%. This trend reflects a significant improvement from growth rates of 3.2% in 2016, 2.9% in 2015, and 0.9% in 2014. 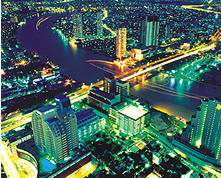 The Thai economy is expected to grow by 3.6 – 4.6% in 2018. Thailand is undertaking economic and social reform to ensure sustainable development in the next 20 years. This effort culminates into the 20-year National Strategy (2017-2036), which will be decreed into law by the new constitution. The goal of the Strategy is to set guidelines and benchmarks for development in order to ensure stability in policy formulation and smooth implementation of the next 4 Social and Economic Development Plans (12th– 15th NESDB Plan) through Pracharat mechanism (public-private-people partnership). As it presently stands, the goal of the draft National Strategy is to advance Thailand toward prosperity, security and sustainability in accordance with the principle of sufficiency economy within the next 20 years, through 6 main strategies, -2- namely: 1) national security, 2) competitiveness enhancement, 3) human development, 4) opportunity building and social equality, 5) green growth, 6) public administration development. The remarkable feature of the 12th plan reflects the relevance of national development agendas with various plans and strategies such as the 20-year National Strategy, Thailand 4.0 development model, and the sustainable development goals (SDGs). Priority of the 12th plan will be geared towards the promotion of science, technology and innovation, together with human resource development and economic reform in order to develop technology-intensive cluster of production, bio-based development, digital economy, and strengthen local economic development. The philosophy of sufficiency economy will continue to serve as the guiding principle for the implementation of the plan. Thailand is committed to fostering and ensuring a favorable business and investment environment, and offering excellent conditions for investors. The government has given priority to investment in 10 target industries, investment in R&D, advanced technology and innovation, as well as investment in a Special Economic Zone. In particular, the government has targeted 4 core technology (biotech, nanotech, advanced materials, and digital), as well as supporting services such as vocational trainings, laboratory services. Manufacturing of pharmaceutical and medical devices are also incorporated into Thailand Medical Hub policy for further cooperation with international investors. Thailand encourages investment in Special Economic Zones (SEZs) along the border to foster economic connectivity with neighboring countries and support ASEAN supply-chain and value-chain integration. This will provide tremendous opportunities for foreign investors to benefit from Thailand’s location at the center of mainland Southeast Asia with easy access to the Mekong sub-region and broader markets. In addition to location-specific SEZs, there are also Cluster SEZs for high technology and future industries as well. In addition to the above investment legislations, the government has undertaken steps to transform the country into a Trading Nation by revising the Custom Act. The revised Act has been entered into effect since 13 November 2017. The amendments -3- introduced in the Act aims to further facilitate international trade and enhance ease of doing business with Thailand. Recently, the government has approved the Smart Visa program to attract foreign investors and experts interested in working within the 10 targeted industries and the EEC. Eligible applicants include (1) Experts (2) Investors (3) Executives and (4) Startups. This program will exempt smart visa holders from work permit and reentry permit requirements, and also entitle them to stay in the country for a longer period of up to 4 years. Spouse and children are entitled to the same rights of the visa holder. The program will be opened for application starting from 15 January 2018. Thailand 4.0 is an economic development model that aims to transform Thailand’s economy toward a value-based and innovation-driven economy. The model will follow the directions of the 20-year National Strategy by building strength from within and connecting the country to the global community under the principle of “Sufficiency Philosophy”, which is consistent with the United Nations’ Sustainable Development Goals (SDGs). Thailand 4.0 is not merely an aspiration for innovative industrial development. The lesson Thailand had learnt from Thailand 3.0 model is that trade and investment must progress hand in hand with innovation and technology. Development based on heavy industry eventually leads to over-dependence on export markets, which is a significant source of economic risk, at the time when the global trade is slowing down.